Kendell Carter is a recent graduate from California State University, Long Beach. His installations bring together elements of urban street culture, modernist architecture, and textile and furniture design, funneling these disparate references into the domain of the museum gallery. 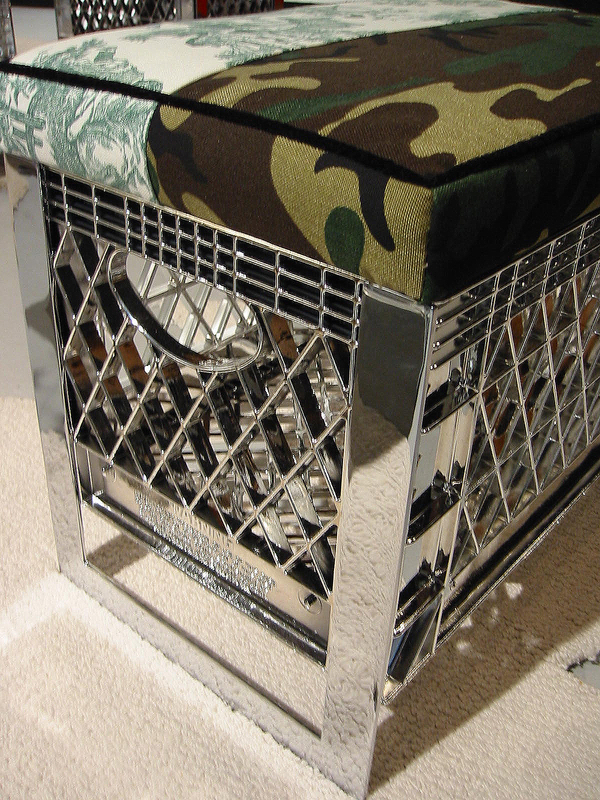 Camouﬂage, brand-name clothing, and three-dimensional, chrome-plated grafﬁti share space with century-old toile designs and molded wainscoting. Carter blends and reshufﬂes the cultural identities of objects and materials, seeking to create a dialogue around their use and signiﬁcance in contemporary society. Kendell Carter was born in New Orleans and lives in Los Angeles. He received a BFA from Atlanta College of Art in 1994, studied environmental design at Art Center College of Design in Pasadena, and is a recent MFA graduate of California State University, Long Beach. Carter's work has been included in exhibitions at Transport Gallery, Los Angeles; the Armory Arts Complex, Pasadena; and the Nexus Contemporary Arts Center, Atlanta. In 2005 he participated in Save the Youth of America Summer Tour 2005: Five Countries, an exhibition that traveled throughout Europe. He was the recipient of a World Studio Foundation scholarship in 2002 and a Krauss Family Foundation grant in 2001. Reviews of his work have appeared in the Los Angeles Times and the New Art Examiner. Kendell Carter’s installation Hommie/Homey is a catalyst for social interaction, an environment that invites visitors to relate directly to the art and to one another through the art. The installation—intended, in Carter’s words, “to create the condition for an alternate perception”1—is a living room that is at once homey and strange. Combining familiar objects with surprising elements, the space offers a dynamic play between several sets of alternative meanings that challenge preconceived notions about the engagement with art and its interpretation. Incorporating a host of cultural expressions, Carter infuses the vocabulary of the fine arts with multiple styles and techniques of design, all based on a profound relationship to hip-hop culture. Sometimes confrontational, sometimes subdued, these improvisational riffs on recognizable forms stimulate immediate and delayed responses. The more one sinks into the art, figuratively and literally, the more signifiers begin to unfold and reveal themselves. While one side of the room looks like a luxurious cocktail lounge with dark drapes brushing against the black walnut frames of cushioned wainscoting, the other side looks like a generic living room, with plants and a store-bought couch. 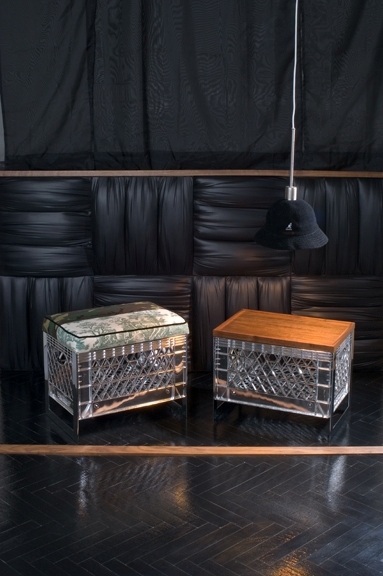 In between lie coffee tables and ottomans made of upturned chrome-plated milk crates. Crowned with walnut or with remarkably designed and flawlessly crafted seats upholstered with an amalgam of cheap and expensive fabrics, the crates-turned-furniture hybridize high and low materials. A daybed checkered with camouflage fabric, toile, and several signature Coco Chanel fabrics also features an illustrated textile about a child’s privileged coming of age that speaks of private clubs and fine cigars. An association between privilege and art is one possible connotation. When one sits on the daybed, several narratives unfold. The toile, evocative of a colonial era, contrasts with the camouflage, a signifier of the urban buffalo soldier, suggesting a historical continuity between the two periods. A different move on the checkered surface might reveal the camouflage design bouncing against the Coco Chanels. Evoking another set of associations about privilege, the two referents can also be read as testimonies to creative ingenuity that turns power structures on their heads, as both designs are taken from a patriarchal order (recall Chanel’s use of men’s fashion) to work against its status quo. Looking to hip-hop as a model for a postmodern practice, Carter refuses the classification of a “high” discourse against a street or pop culture. Rows of lampshades made of black Kangol hats are not only a shout-out to LL Cool J and his creative output but also a gesture in utilitarian design brilliant in its simplicity. The homey interior is suspended at several intervals by the vocabulary of the street—the terrain of the hommie. 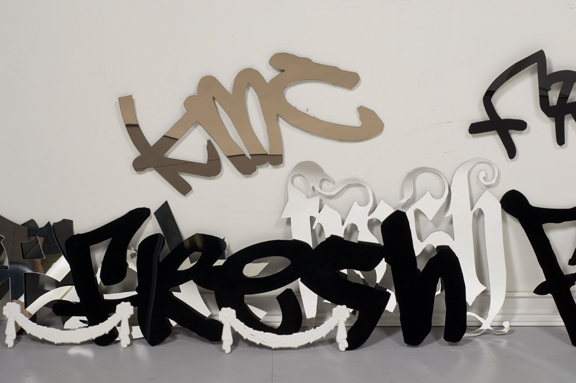 On the wall, a shadow sliver reveals that a series of graffiti renderings of the word fresh are made of solid acrylic lettering and mounted on the wall. In this Duchampian tongue-in-cheek gesture, both objects and text are “fresh,” testifying to their own quality as either “something new” or “something original and different.” Thus fresh may be read a noun, a verb, or an adjective, its meaning constantly slipping according to the relation to any given referent. In effect, Carter’s installation is structured like the interaction among multiple figures of speech. Both are hybrids, a bridge between text and shape, language and form. By juxtaposing elements that do not belong together—using irony, double entendres, comparisons, contradictions, and animation—he overlays meaning into manifold interpretations. The connotation of each component is multifaceted, and their combinations reveal allegories about social interaction and historical hierarchies. The elements in the room stimulate a slippage of signification, in which associations flow in and out of one another. Signifiers of high and low cultures intertwine. The herringbone floor is not the luxurious hardwood it signifies, but a cheap emulation in linoleum. The stylish pillows adorning the couch turn out to be handcrafted from shoelaces, perhaps nodding to the unlaced shoes of the band Run DMC. The upholstered wainscoting looks like enlarged goose-down jackets, also nodding to the hip-hop culture of the 1980s. The wall is decorated with a cornice, a familiar construct in Victorian-style interior decor, but this example is manufactured from atypical transparent acrylic and thus contributes to the ambiance of contradictory aesthetics. These moldings overlap a wall drawing of the break-dancing troupe Rock-Steady Crew, famous for broadening the common conception of what hip-hop culture is. The images also recall a recent history, in which street congregations of break-dancers and rap free-stylers engaging in cultural forums were consistently broken up by the police because they were seen as potentially threatening. Break dancing, itself a hybrid style of dance and gymnastics, is represented as a broad cultural field. An alternative to the alternative, the video Rawness 3 by Wild is incorporated into the installation as an artwork within an artwork. Wild, a man in his forties, wears obviously composed yet ill-fitting and outmoded outfits and performs an outlandish personal rendition of break dancing. His performance is spliced with those of several young, hip, and highly skilled street and gym performers who have distinct personal styles, rendering it somewhat absurd. Nevertheless, despite his comparatively limited skill, there is merit to his performance, which raises questions about the relationship between artistic criteria and skill. Throughout his artwork Carter has combined street fashion and culture to create art that is both visual and utilitarian, allowing the viewer to access it in multiple ways. 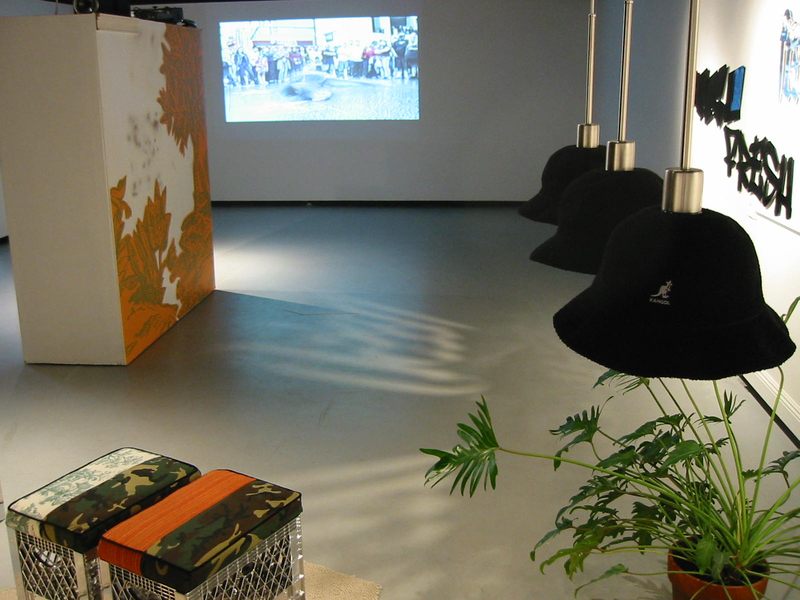 Works like Fresh for 85 (1998) and Urban Ottoman (1998) are furniture pieces made of popular street fashion and materials like domino blocks, all of which are already loaded with meaning. Screen (1997) is a partition on wheels created from multiple cans of spray paint. Appealing in its straightforwardness, the object is nevertheless complex in its meaning. The term screen evokes both the discourse of Clement Greenberg and the pictorial flatness of high modernism in a dimensional object. In addition, it refers to graffiti art, as well as to the soup cans of Andy Warhol. An array of contradictory art histories are fused into an object that enacts a declassification of traditional disciplines. The installation Hommie/Homey weaves a subtle framework for new taxonomies, which seep through the seams and into the viewer’s consciousness not only through vision but also through an active use of the art. Nizan Shaked is a curator and an assistant professor of museum studies and art history at California State University, Long Beach. Hammer Projects is made possible with support from The Horace W. Goldsmith Foundation, the Annenberg Foundation, Fox Entertainment Group's Arts Development Fee, the Los Angeles County Arts Commission, members of the Hammer Circle, and the David Teiger Curatorial Travel Fund.